Autumn at the Manor features a bustling kitchen alive with the sweet scents of fresh baked seasonal treats. Large windows bathe the kitchen and its vast array of copper and cast iron cookery with light. A basket of fresh-picked orchard fruits sits near the scullery, awaiting a quick rinse before being sliced for rich lattice-topped pies. Warm sugar-dusted sweets, pumpkin, flaky pastries filled with peach preserves, sugar cookies, caramel and vanilla combine with a touch of hay absolute, all embraced by a generous dose of sweet wood smoke to bring you the Manor's fall kitchen experience. Kitchen is opens with a burst of sweet pumpkin followed by very gentle baking spices on initial application. Juicy peach and a hint of frosting quickly follow with a warm buttery pastry and soft sugar cookies underneath. The wood smoke is generous but doesn't begin to emerge for about 15 to 20 minutes after application. It does get stronger as it warms on your skin and the fragrance begins to waft softly around you with the sweet wood smoke, baking spices and mouth-watering baked goods. Kitchen is warm and comforting, morphs wonderfully and the dry down is the essence of autumn. The wood smoke is primarily detectable in the Perfume and Burnishing Glace on the dry down. The Whipped Soap is strictly gourmand, capturing the sweet pumkin, baked goods, soft spices and a touch of peach with the wood smoke not being very apparent. I wasn't sure that I needed another spicy pumpkin scent, but I got a sample of this one anyhow. And I *really* like this one. It has that cinnamony, buttery pumpkin that's common around this time of year, with a hint of juicy peach, what smells like slightly burnt sugar cookies on me (in a good way! ), creamy vanilla, and a whiff of freshly baked bread. It really does smell like a kitchen full of delicious treats that are fresh from the oven. It's warm, creamy, sweet foodie, and spicy without being overwhelmingly spicy. Only lasts about 3 hours on me and has moderate throw, but it's a fun, cozy sort of scent. I don't know that I'll order a full bottle, but I'm definitely keeping my sample. I have been slathering this one on today after trying some yesterday (yesterday was heavier on Witch's Cottage). This is such a perfect perky happy scent to me. At first application, I get a lot of the peach, and under that rests the pumpkins, spice breads, and caramel. As it dries, the caramel and spices dominate on my skin, with the peach fading into a supporting role and the pumpkin hanging on for the ride. So far, on several applications, I do not get any smoke (oddly). I was looking forward to it, but I love this scent so much as it is that it's almost irrelevant. Love this one! Kitchen is GREAT! It reminds me of Witch's Cottage a bit. I love how scents smell different to everyone. Some people mention that they smell a good deal of peach, whereas I don't smell it hardly at all! (Thank goodness.. that's the note that scared me away from this blend!). I smell pumpkin, sugar cookies, a bit of pastry, a spicy baking scent, vanilla, caramel and smoke. It's not as herbal as Witch's Cottage. The main notes to me are the pumpkin, bakery spices, caramel & sugar. Think Witch's Cottage with spices instead of herbs. This smells like my grandmother's kitchen during Thanksgiving. She was in charge of the pies, so that's where I always wanted to go to help out as a child. This smells like her buttery, flaky crusts and peach cobbler. I'm also smelling something caramelized. It's sweet, but warm too! I want to eat my ganache with a spoon, and then ask for seconds. I've always been more of a foody smells person, particularly ones that remind me of baking at home or call to mind the holidays. Kitchen is PERFECT. It's not overpowering, but it has a complex mix of elements that call to mind memories of baking with family during fall/Christmas time. It's a very warm, cosy smell. Perfume: Pumpkin first then the Caramel into the Sugar Cookies and Peach with a bit of the spices and sweet wood smoke at the end. Wow, this one is really complex and the different notes run through my nose. This has surprised me because it's such a sophisticated food blend. It's a little “darker” but you have your hits of light/sweetness. Not too overpowering. I bought a bunch of samples last year from the manor and fall collection, and for some reason only rediscovered the bag recently. The first one I brought out to try was kitchen, and fell in love instantly. I love that it's foody but not overwhelmingly so. It has so much warmth and smells exactly as it's described. When people smell me while I'm wearing this they say I smell like "fall" I think it evokes those memories of holiday dinners with the family and all the feelings of warmth and comfort that go along with it. Weird that a smell can conjure up so many emotions but it does just that. Definitely a new favorite of mine. Kitchen is definitely for lovers of gourmand perfumes. Initial application is sweet pumpkin and juicy peach, with spices and butter in the backseat. Upon drying, the buttery pastries and spice breads emerge stronger, and even later, a sweet smokiness is detected. This is a very delicious homey scent. I would love for my kitchen to smell like it all autumn, it's just perfect for the season! 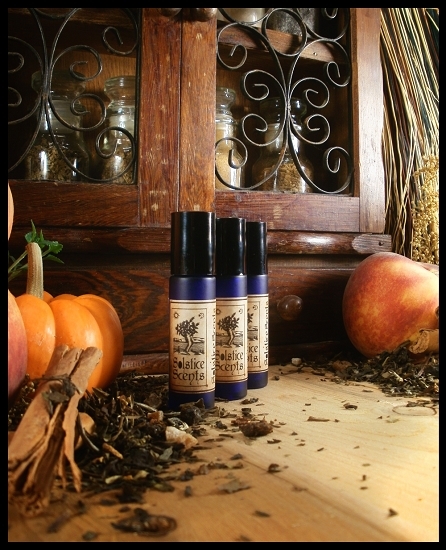 To my nose, Kitchen and Witch's Cottage are from the same scent family because they both have a comforting warmth and smell like seasonal baking. However, Kitchen is entirely a gourmand scent, while Witch's Cottage includes a green herbal note that widens the perspective/experience. In other words, Kitchen is a deep inhale with your nose in a basket of cookies, fruit pastries, and spice cakes; Witch's Cottage is the smell of the entire room of baked goods, herbs, and soft wood smoke. Smells like warm sweet peaches and the sillage is amazing. My favorite part is around the middle where all the spices comes out. I wish it would stay like that forever but the drydown is sweeter and smells like caramel (which after a bad experience with another perfume tend to make me slightly sick). Definitely try this if you like gourmand fall perfumes! My first experience with Solstice Scents was ordering the samples from Manor. What drew me to this company was the descriptions of the scents. They not only indicate what the scent consists of, they spin an entire story around each one. The romantic notion of wandering through a large mansion, exploring each room, really appeals to me and takes me back to another time...perhaps another lifetime. I have tried each sample and I must say that when I put Kitchen on, it blew me away. I immediately felt a sense of coziness and peace, like the feeling you get when you step into a warm kitchen from a cold winters day. Fragrances cause me to dream, and this dream is a lovely mix of security and holiday excitement all rolled into one. I can't wait to see how my husband responds to it, because I absolutely adore it. I bet he'll want me to bake a pie. I've started to think of Kitchen as the winter counterpart to one of my other favorites, Chantilly Cream. They're both peach scents, but while Chantilly Cream is sort of the innocent youth of peach, Kitchen is sort of the wise but still saucy Lachesis of the SS foodie scent family. Chantilly Cream has some citrus notes to it, and Kitchen has a pumpkin backnote to it. I have the ganache in Kitchen, and what I smell like after I slather it on is a pie made with atypically late peaches and buttery pastry. With caramel sauce. This perfume smelled like caramel and burnt sugar cookies on me. It's a nice autumn baking smell, but didn't last very long on me at all. This was another scent that smelled a lot better on a friend than on me, so I ended up giving this one away. On my friend you could smell more spices and baked goods, and it lasted a bit longer on her. Kitchen was the one scent that, when I ordered a bunch of samples as my first SS order, I debated just going ahead and getting a full sized bottle of. It sounded absolutely delicious. I love this scent! I'll admit that I get more spiced peaches than pumpkin and much else, but its very pleasant and unique. It reminds me of the apple torta tutti dulce fragrance they used to sell at B&BW back in the day! Kitchen is an awesome spicy/sweet gourmand scent if you're into that sort of thing. I can see the comparison to Witch's Cottage; it's a distant relative. Whereas WC has a savory element to it, Kitchen is definitely the sweeter gourmand variety. One of the strongest notes I pick up is peach, followed by brown sugar (peach cobbler!). If you are a fan of the Foxcroft gourmands or Blueberry Muffin Batter, check this out. It's been a year since I initially ordered from SS and after being thoroughly disappointed with all the perfumes I ordered, I've done a complete 180. It seems I need to give perfume oils at least 6 months to a year to calm down and for their "true" scents to come out because this perfume smells so different to what it initially smelt like. When I first got it, it was just too sharp and the spices were too prominent and all it did was give me a headache. Going into cooler weather now I decided to see how I went with it and boy o' boy, have I fallen in love with this scent. I'm mainly getting the peach with the spices and the jammy kind of smell to it which is the reference to the danishes and pastries. I think the peach is more prominent at first but then it settles down and blends wonderfully with the pumpkin. I don't know what it is about this scent, but I keep wanting to go back it, and when I put it on, I feel so happy that it's autumn and I'm wearing this delicious scent. Ugh, so good!! I love Kitchen. I initially had the whipped soap, but recently got the perfume. My boss was complaining when I wore Jack and the Devil that someone was "wearing hippie oil and that doesn't mesh with my nose." so I have been using Kitchen at work and no complaints now. To me it smells like peaches and hay. I'm not really a peach kinda gal, but this doesn't smell like a country rednecky peach scent (lol). It smells complex. Kitchen is more soft and gentle than I imagined it would be from the description. My very first thought on smelling it, was that the opening is somewhat akin to the warmth of Solstice's Roasted Chestnuts offering in terms of the sweetness of the spices selected. There is a definite fruit note which is lovely, though it is not as peach like as many reviewers state to my nose and like real fruit Danish Pastries could be interchangeable with plums, apricots or stewed pears. I guess if I had to pick I probably would go with cooked peaches, but just. I find the pumpkin is strong in the opening phase along with another sweet note, but I am unable to pin down what I think the note is. It definitely is in the gourmand category right through its duration. I agree with Angela that in the dry down, soft wisps of smoke become evident and add to the complexity. Cool weather suitable definitely and perfect in a casual setting. Mmm, this one smells like a warm pumpkin spice muffin to me. It changes very little on the dry down, but after a few hours it mostly just smells like fall spices. Normally my skin amps up all things spice, but Kitchen plays surprisingly well for me, and it was the first full size (and Cenobite) that I ever purchased. A+! Before buying a sample of this I had read many reviews that said it smelled like a candle. Well, yes, it does. Specifically, it smells like the Apple Pumpkin Yankee Candle that is usually available during the fall and winter months. This is my absolute favorite smell on the planet so I was thrilled to find that Kitchen was so similar. The pumpkin is not super spicy in a pumpkin pie sort of way, it is more of a squash-y note, like fresh pumpkin with a bit of spice. For me the peach note just adds a general fruity vibe to the whole thing rather than standing out as a specific component. The pastry notes and bit of smoke make this a homey, kitchen sort of scent rather than your typical pumpkin gourmand. This is the type of warm and comforting scent that is basically happiness in a bottle for me. I put it on and I just feel better about everything. Another yummy well-blended gourmand from SS. They are so good at these. The site’s description is right on, to me. This one smells of caramel, and pie and spice breads being baked. It’s warm and a little bit buttery, like pastry crusts and toast. Also a bit like pumpkin spice scented candle. Overall rather a Thanksgiving scent, but then, I’ve always been fine with wearing “autumnal” scents all year. Comfy and not overly sweet; the spice and a hint of smoke balance the dessert scents nicely. Ordinarily I’d be unsure about a pumpkin-spice-candle perfume, but this one’s so nicely done I’ll at least finish the sample, I bet. Very good staying power: could still smell it at the end of the day. This is a really nice scent if you like spice and fruits. The peach stands out for me, in a good way, but I definitely agree they are more of the canned peach variety versus a fresh peach. It's like a peach pie that you are assembling in the kitchen before baking it. Think gooey, sugary, peachy goodness. The smoke is there but doesn't stand out for me. This is a scent I have to be in the mood for, and it's very strong so a little goes a long way.